GIFTS FOR MEN: THE WATCH LOVER | muted. Luxury watches are the perfect gift for any man, a functional accessory which looks good both day and night. These type of watches are an investment, a quality piece of craftsmanship which can be handed down from one generation to the next, potentially even growing in value. The work that goes into the production of these watches is immense, with highly skilled horologists fitting the hundreds of intricate parts painstakingly by hand. It is of little surprise therefore that luxury watches have a dedicated following, with men who appreciate the expertise and artistry in each and every model. However, horology goes beyond expensive wristwatches, it also incorporates lower cost watches like Seiko’s which are easy to mod and make uniquely yours. If you are a fan of horology or are looking to buy a gift for a fan, take a look at this guide of the best gifts for watch lovers, compiled especially for horologists. In our updated gift guide we provide 30 of our best picks for the guy who loves watches. You might just be a collector who has winders galore or maybe even a watch safe. Or you might be one of the new breeds of modders who likes taking basic timepieces and turning them into something special. Our buying guide, Gifts For Watch Lovers will give you some great ideas for these individuals. Everything from our best bang for your buck watches, to watch winders, to tools for those modders. 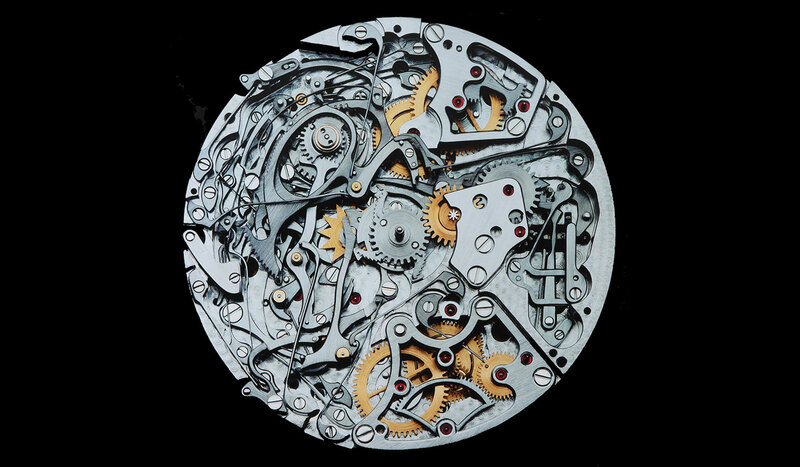 “For the man who’s obsessed by the smooth movements of watchmaking, the innermost workings hold an endless fascination. Free of electronics, the mechanisms which form the heartbeat of the watch are a true thing of beauty, an intricate woven network of tiny parts. Guido Mocafico: Movement ($185) is a book which will be truly appreciated by both photographers and horologists alike. Every right-hand page features a full-size glossy photograph either of the section of the inside of the watch or the watch overall, in vivid technicolor detail. Some of the world’s best watches are featured including those by Patek Philippe, IWC and Piguet captured in all their glory by photographer Guido Mocafico. The ultimate coffee table companion, this encyclopaedic volume will be a delight for any keen horologist. Everyone knows that a change of a watch strap can change the whole complexion of your favorite watch. Wearing khaki’s? Go for something in a blue strap. Headed out to a dinner party? Swap in a black band. Whatever the occasion, or the outfit, you can find a band for it. 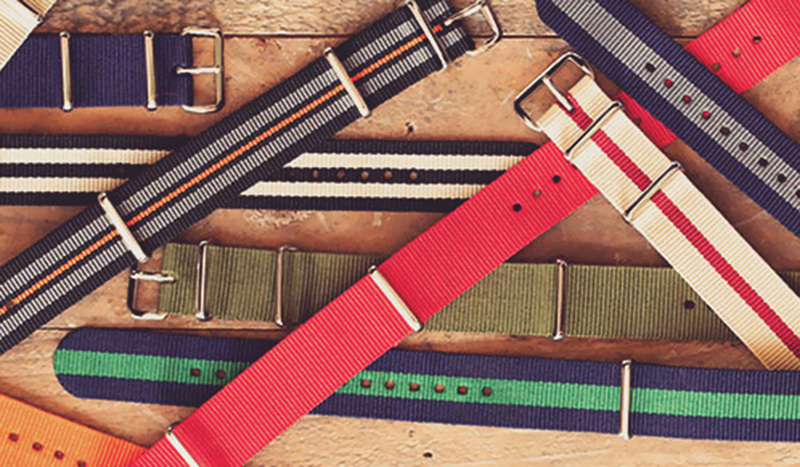 NATO Straps from Crowne & Buckle ($12+) are some of the best out there and they come in multiple widths, and colors. Know a watch collector? Then one of the most valuable tools they can have, but probably won’t buy for themselves, is a Loupe. Loupes allow you to closely check the condition of prospective watches, to assess all components of the watch for counterfeits or incorrect parts, or take close up videos and images to show off the beauty of the movement. If you or a friend are serious about your watches, then you will want to check this out. One of the best choices is the Loupe System Loupe ($525). The starting system comes wrapped in black silicone rubber and is available in two models: A 6x Model 01 loupe and a 3x Model 02 loupe. Both were designed based on the same principles as a camera lens. Each lens has several special coatings, and is designed to maximize contrast, color saturation, color fidelity, and minimize flare. 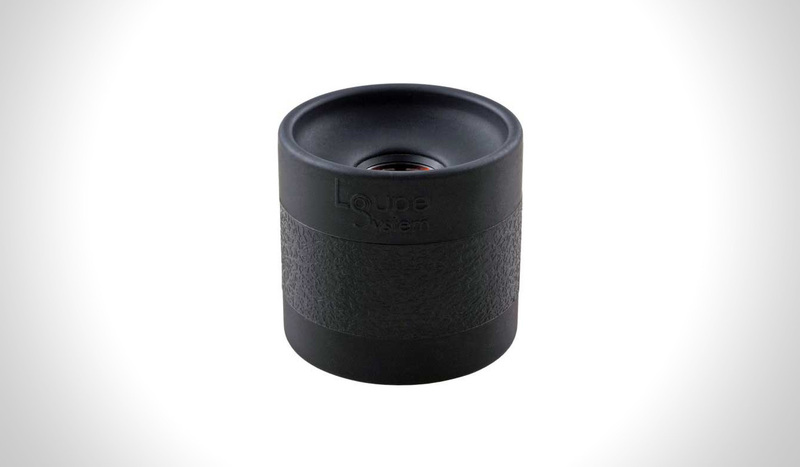 Each Loupe comes with two interchangeable silicone rubber top elements. The standard elements of the Model 01 give a 40mm-wide viewing field, and a 60mm- wide field on the Model 02. The alternative element gives the 01 a 50mm field, and the 02 a huge 70mm field. The 6x Model 01 features five multi-coated optical glass elements arranged in three groups. If you’re looking to resolve more detail than you want the Model 01. The 3x Model 02 features four multi-coated optical glass elements also arranged in three groups. If you want the widest viewing angle, while maintaining a good amount of detail, then the Model 02 is the best choice. Each kit comes with two silicone rubber elements, a microfiber carry pouch, a hard shell carry case, and a microfiber cleaning cloth. OK, so we just went over the amazing Loupe System Loupes, but what if you wanted to kick everything up to the next level? 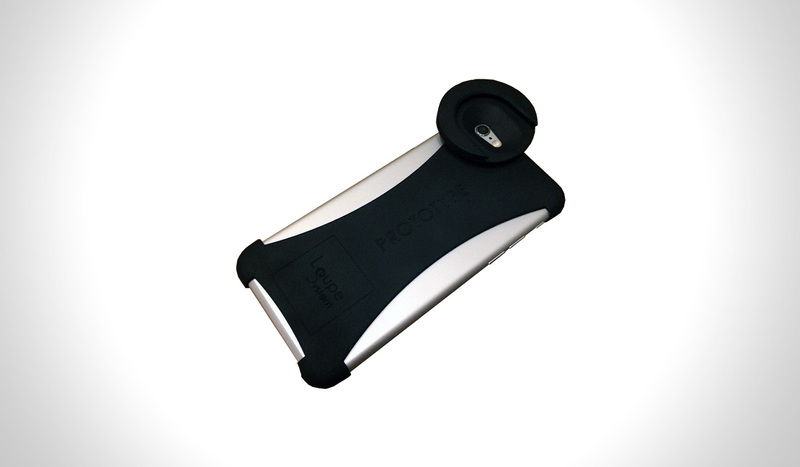 Consider Loupe System Phone Mounts ($80+) for your iPhone. With these mounts you can take breathtaking images and videos of the watches components and movements. Even if interest is in macro photography, you can’t go wrong with this setup. Check out some of the images below to see what’s possible. “The typical horology enthusiast will appreciate clever technology and Ticking Mugs ($13) from Cafe Press fits the bill. 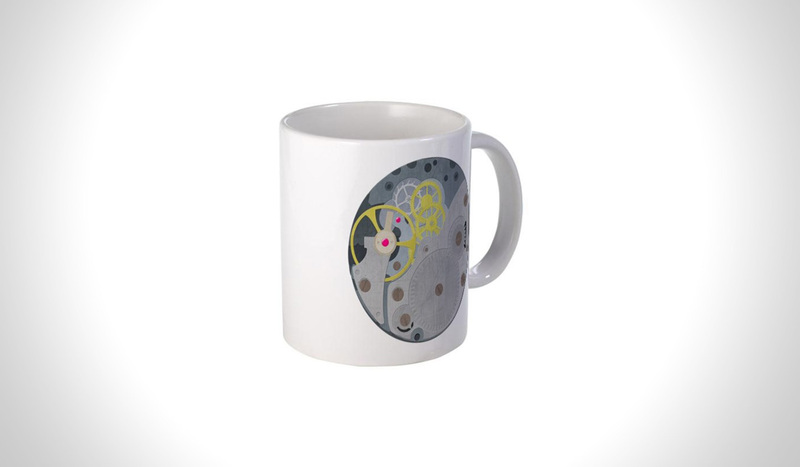 Looking like a black plain colored mug, as hot liquid is added,the intricate horology design is revealed in all its technicolor beauty, while the background color fades from black to white. If you’re looking for a gift for a watch lover, then maybe this one needs some exploration. A lot of collectors prefer automatic mechanical watches that wind with the movement of the wrist. If they have a number of watches and they are swapping, those watches will stop running and need to be reset each time they want to wear them. 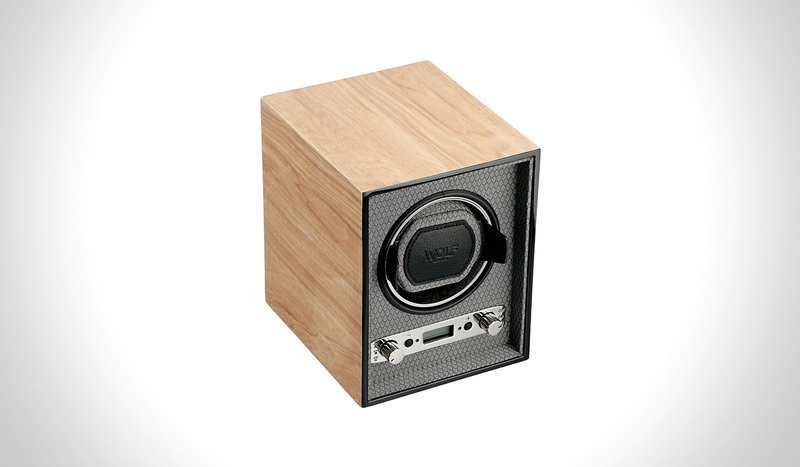 With the Wolf Meridian Single Winder ($250) that issue is resolved. The Meridian features 57 programming options, including rotation settings from 300-1200 turns per day, directions setting options of clockwise, counter-clockwise and bi-directional, backlit LCD display, lock-in cuff to secure larger watches, and a program start delay from 6 hours to 72 hours. A handcrafted creation, the Peregrin Vintage Men’s Watch Cufflinks ($46) are intricate and clever, and made from vintage watch parts, making them the perfect gift for horologists. 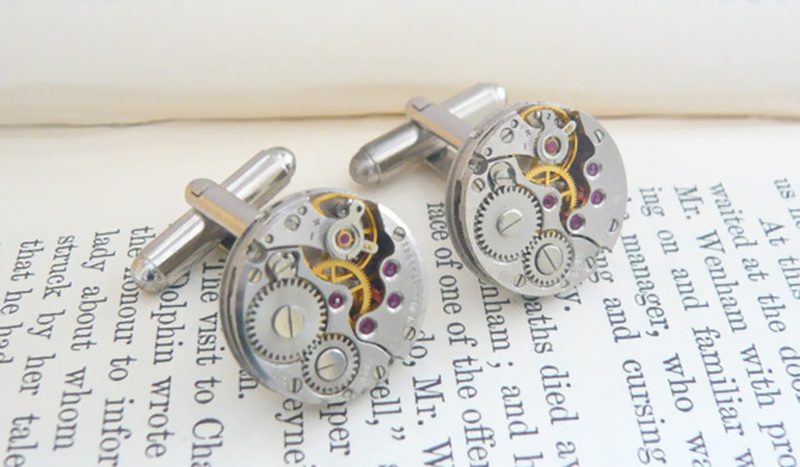 Created individually from actual watch movements, these cufflinks are sophisticated and smart, yet very unique too. Understated enough for use during the day, they’re also a sufficiently eye-catching accessory for evening wear. Measuring approximately 16mm, the cufflinks are nickel free and come presented in a gift box. Peregrin Vintage offer a number of different watch cufflinks and can also create custom designs, if you had something more specific in mind. 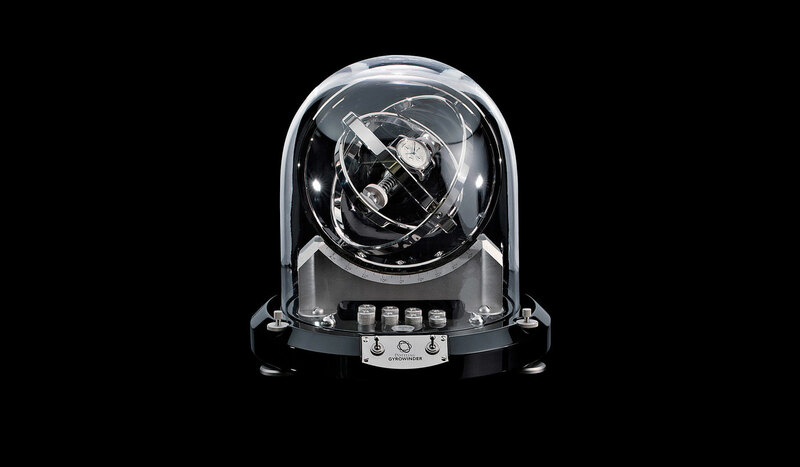 “For the ultimate luxury gift, the Gyrowinder Watch Winder ($25K) from Dottling is the perfect companion for any luxury watch with an automatic mechanic movement. For those days when it’s not on the wrist, the Gyrowinder keeps your watch wound and working, to save any manual winding. More than just a practical device, the Gyrowinder is a thing of beauty, with its mesmerizing action, encased in aluminum. Allowing the watch to rotate freely in every direction, the crystal glass, hand-blown cover shows it off from every angle. Just like the Worn & Wound website says, “Every watch collector needs some way to store and carry their favorite timepieces.” If you know one of those guys who love collecting watches and needs an elegant way to carry them, then the Worn & Wound Watch Roll ($150) is a must have. It’s designed and constructed in New York, and made from a tan 10.10 oz waxed army duck canvas, with pockets and trim made from Horween black tumbled Essex leather. It will hold up to four watches and fits sizes up to 50mm wide comfortably. If you know someone who is using pins, or a kitchen knife to change straps on their watches, it’s time for an intervention. Buy them the Burgeon Spring Bar Tool ($30). This tool removes, measures, and inserts all types of spring bars. The tips are made from tempered steel, with one flat end and one pointed end with a diameter of .8 mm. 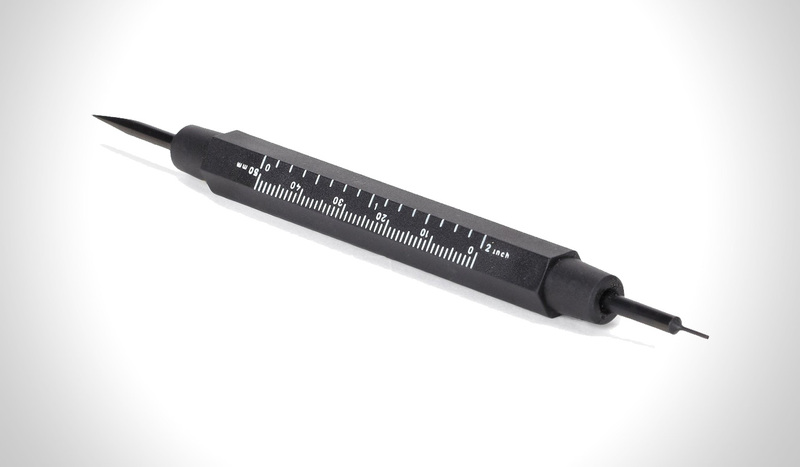 The plastic handle includes a millimeter scale for measuring and selecting the right bar. If a tip gets damaged you can replace it with a replacement which are available for purchase: Flat Forked Tip ($9) , Pointed Tip ($7). The Ohuhu Watch Repair 157 Piece Tool Kit ($17) does exactly what it says. It saves you a trip to jeweler and allows you to change and size your watch straps and bracelets at home. It has all the same tools the pros would use. 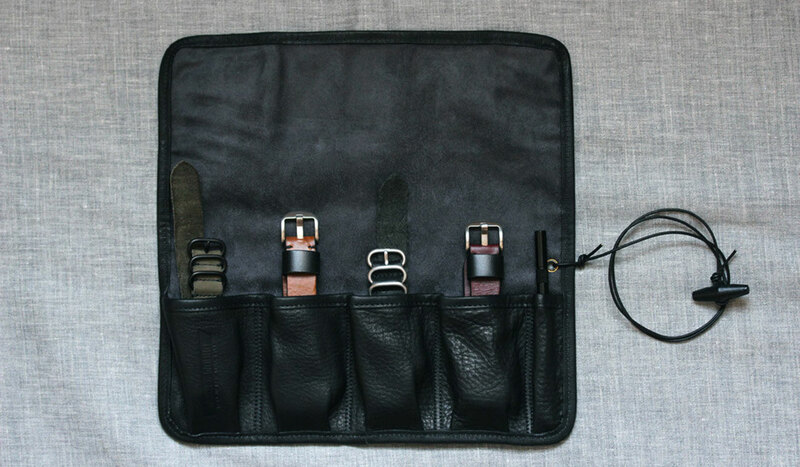 The kit includes 1 hammer with one metal and one plastic head, 6 precision screwdrivers, 1 box of 156 piece spring bars, 1 Tweezer, 3 loupes, 1 Watch block, 1 Watch band link remover, 2 Watch back openers, a 1 Adjustable watch case opener, and much more. Everything comes in a cool heavy duty case.